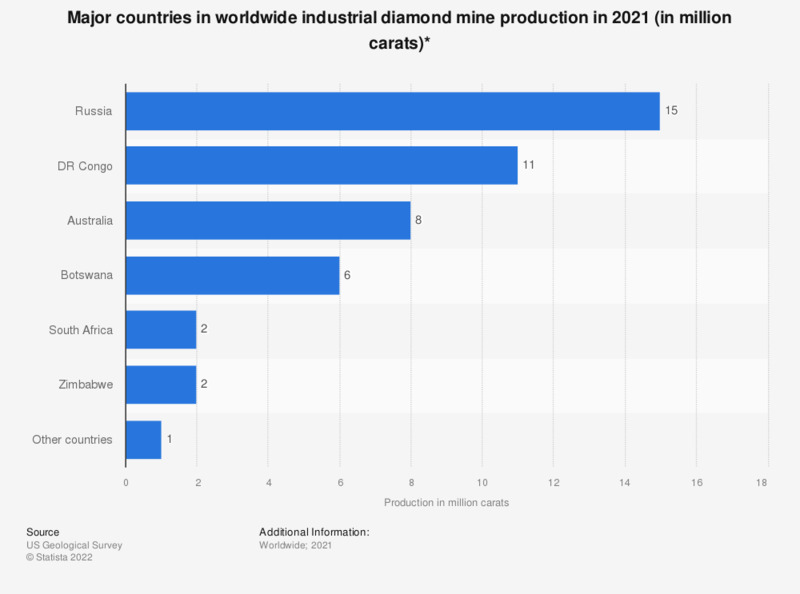 This statistic depicts the major countries in worldwide natural industrial diamond mine production from 2013 to 2018. In 2018, Russian mines produced approximately 19 million carats of diamonds, making it the world's largest natural industrial diamond producer that year. Diamonds are a coveted material often used in jewelry, as well as for industrial purposes due to their extreme degree of hardness. * Natural industrial diamonds only. Note that synthetic diamond production far exceeds natural industrial diamond output. Worldwide production of manufactured industrial diamond totaled at least 4.5 billion carats in 2018; the leading producers included China, France, Ireland, Japan, Russia, South Africa, Sweden, and the United States.